Tiny Tree Frog Watercolor – Let's Paint Nature! A hard rain unleashed in a matter of seconds. Suddenly the ground was moving with what I thought were crickets. I bent my giant monster frame down to the ground and behold, my eyes widened like saucers when I recognized tiny tree frogs. I’m always searching for frogs. I used to monitor them at night and report it to the Cook County Forest Preserves years ago. When it comes to the small fellers, sometimes I would be on top of their cries but never locate them. It’s very frustrating when you hear how loud they can be. Deafening almost. But on this stormy day they came to me. It’s no larger than half an inch. I believe this is a grey tree frog. They can camouflage from black to almost white. I’ve heard that the tree frog expands his throat 3 times its size and its call is so powerful, that he may only have 3 days of energy to make it. Amazing. Nature is delicate, tiny, mighty, and forceful all at the same time. As I related in another post, nature without God is dead. The opportunity was present and the frog came to me. I did not have to search this one out. I do not see these occasions as chance. So I always ask myself: What lessons do You want me to learn here? How can I share what You teach me? On Sunday, August 9th, I was at Jimmy’s Drive-In in Justice, IL having lunch. A tall young man (about 15) came in, ordered, then sat down to wait for his order. He stared down at his lap and did not move one inch the whole five minutes he waited. The look on his face was sadness, hopelessness. It almost seemed as if he felt uncomfortable in his own skin and didn’t want to look up. My soul was anguished. I wanted to do something or say something. A million things were racing in my head but I couldn’t grasp any one thing to say. He grabbed his order and left, walking down Robert’s Road. I though about following him and asking him if he was okay, but I didn’t. 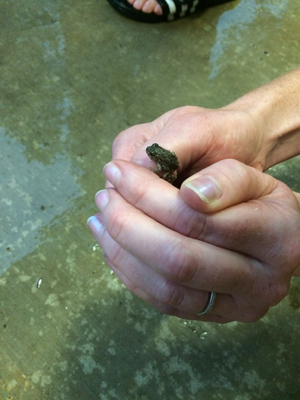 I believe just like the tiny tree frog, God send this unexpected run-in opportunity my way. Because of my fear and shyness, I did not seize this opportunity to ask if he was okay. I want to apologize to the young man that I didn’t step up. If you could only know the love our Everlasting Father has for you, you might have been encouraged. You are loved and valued, not because of anything you have done or not done, but because of Christ’s grace and mercy. This itself is hope. God’s love is delicate, tiny, mighty, and forceful all at the same time. There is nothing impossible for Him and if it pleases, may this message get out to the young boy, whom I’m sorry I did not take the opportunity to connect. A beautiful picture – a magnificent story – both of them … a lovely opportunity even in its missing …. One of the best blog posts I have read in a while. We all have those “missed opportunities”… A kind word can really make a person’s day, especially when it is a word of compassion. I love your blog and all your watercolor tips! 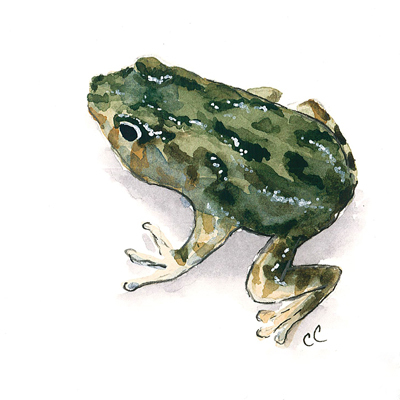 The frog watercolor is so wonderful. About the boy, many who read your posts I’m sure will pray for him. Thanks for giving us that information and opportunity. PRAYER WOULD BE WONDERFUL!!!!! Wow! That’s incredible…God’s army can pray for that boy and that means hope! I’ve been praying here and there, but more is better! Thank you Karen!! Maybe God (your “Intuition” with a capital “I”) was telling you to hold back. Sometimes it is best to simply notice and then say an affirmative prayer for the person like “I know this person is in Your Care, Father, and You will guide me to know what to say or do.” Sometimes the best (and safest) thing we can do is feel our empathy and compassion for people and wait for God’s signal to take a pro-active step or to hold that person in our Sacred Heart and Trust in God’s Intuitive Guidance. Your sensitivity is precious. 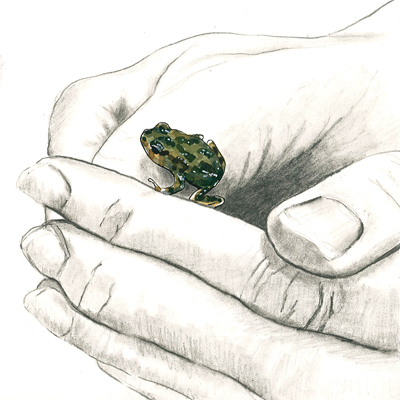 The frog is beautiful and you showed this (as you always do in your artistic work) as one more Expression of God’s Love for all of us with so many different creations, colors, sizes, shapes and sounds that were created for us to marvel at and enjoy. Thank you for such a beautiful post. Thanks Alanna! Yes, God is still in control…. and prayer is worth gold. It is a comfort to know that we are not responsible for the outcome of the world. I will try to be more forthcoming though…next time. Isn’t God’s tiny creatures amazing?!?!?!?! I love it! Thank you for your encouragement to not let those moments and opportunities slip by. And your paintings and descriptions are beautiful.